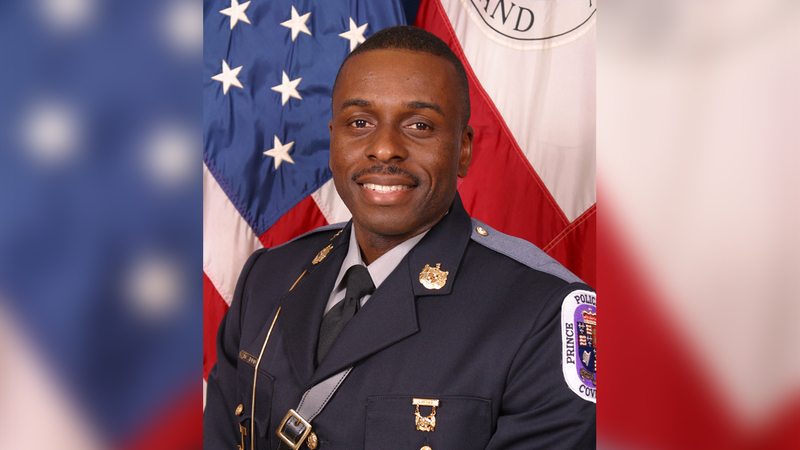 The man accused of killing an off-duty police officer in Prince George's County on Wednesday eluded law enforcement officials for weeks after he violated a protective order his estranged wife got against him, officials say. Police had tried in vain for about a month to track down Glenn Tyndell, county state's attorney Angela Alsobrooks said. He said he would turn himself in on active warrants for assault on Tuesday, but he never showed. The next day, he went to his wife's house in Brandywine, Maryland, and encountered Cpl. Mujahid Ramzziddin. 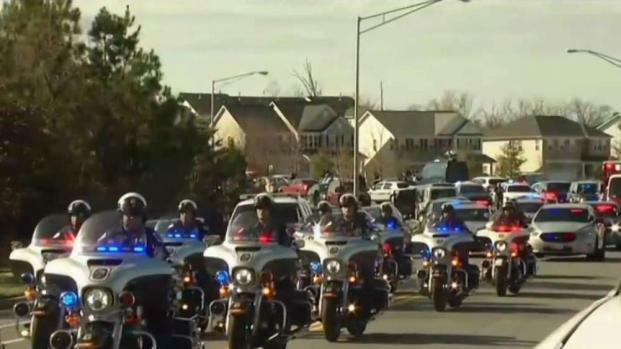 The decorated officer tried to protect his neighbor after she asked for his help. Then, police say Tyndell, 37, shot and killed the officer, who was a Marine Corps veteran and a father of four. Tyndell's wife filed three complaints against him, resulting in warrants. He already had a history of domestic violence in multiple jurisdictions. In January, she told police he violated a protective order she got against him. She said he stole her car key, tax documents, passports, life insurance policies and more, court documents show. 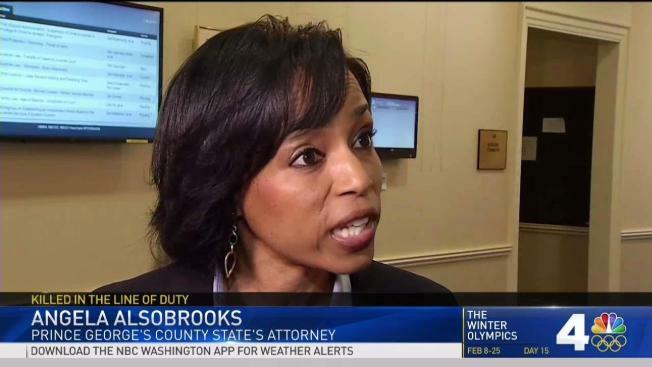 The Prince George’s County Sheriff’s Department responded, Alsobrooks said. "They went and set up surveillance. They sat in front of family members' houses. He was elusive," she said. "He was in a different county and they never were able to arrest him." Deputies made contact with Tyndell days before he allegedly shot Ramzziddin. "They were able to finally get him on the phone over the weekend. He promised that he would turn himself in on Tuesday," Alsobrooks said. After Tyndell failed to show up, deputies were set to track him down Wednesday night. Before that could happen, at about 10:20 a.m. Wednesday Tyndell went to the house on Chadsey Lane where his wife lived. Sources close to the investigation say Tyndell parked at a community center about a half-mile from the house and walked over. At the time, she was having the locks changed. When Tyndell arrived, Ramzziddin was outside. The woman had asked for his help. Tyndell then emerged with a shotgun, shooting and killing the officer. The suspect then took off, dumping evidence along the way. Police say he led them on a chase, which ended in officers shooting and killing him. Intense cellphone video obtained by News4 shows officers running between cars on Route 210 as they chased Tyndell. The two officers who shot Tyndell are on routine administrative leave, pending the end of the investigation into the shooting. Cpl. Mujahid Ramzziddin was shot and killed while trying to help a woman during a domestic situation, Prince George's County police say. News4's Jackie Bensen and Shomari Stone have team coverage. On Thursday, detectives searched a lake and wooded area near the neighborhood where Ramzziddin lost his life. Sources told News4 they were searching for Tyndell's cellphone and a shotgun he used, and that both were recovered. Neighbors of the former couple said violence had spilled out of their home on multiple occasions. Once, sheriff's deputies used a bullhorn outside the house, ordering Tyndell to go outside, neighbor Earline Harris said. On Valentine's Day, Tyndell was back and the former couple argued in the middle of the neighborhood. "The altercation escalated, a little physical. They were seen by some of the neighbors," Harris said. Ramzziddin was a Marine Corps veteran, a father of four and his mother's only son, officials said. He served on the Prince George's County police force for 14 years. He was 51. Ramzziddin was a devout Muslim and went to Masjid Muhammad in Northwest D.C. Prince George's County Police Chief speaks furiously and with great sadness about the man who shot off-duty police officer Mujahid Ramzziddin on Wednesday. "It’s understandable that he was doing something that he always does and that is try to be useful, try to be helpful," Imam Talib Shareef said. "He was a good brother. Good father. Good Muslim," said Sabir Saleem, a retired D.C. officer and friend of Ramzziddin. Ramzziddin's funeral is set to be held Friday at the Diyanet Center of America in Lanham.